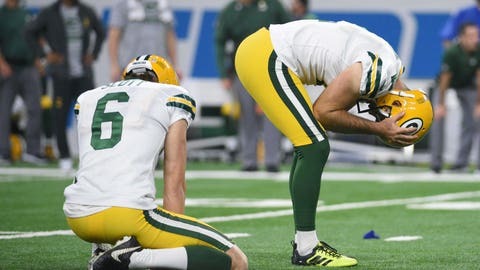 DETROIT — Mason Crosby didn’t have any excuses Sunday afternoon. He got a small amount of redemption by making a 41-yard field goal with 2 seconds left, but his onside kick bounced directly to Detroit’s Marvin Jones. To make things even stranger, the game was played indoors at Ford Field, a kicker’s paradise. Crosby is working with a rookie long snapper in Hunter Bradley and a rookie holder in JK Scott, but they didn’t appear to be at fault on any of the kicks. The 34-year-old kicker came into the game having made 10 of 11 field goals this season, with the only miss coming outdoors from 52 yards. The Packers had their next chance to kick a field goal late in the third quarter when they faced fourth-and-4 from the Lions 30. Crosby jogged onto the field, but the Packers decided to go for it. Rodgers scrambled for the first down, setting up Green Bay’s second touchdown. If Crosby had made the three medium-range field goals in the first half, the Packers could have been within 24-23 instead of trailing 24-14. The missed kicks meant Matthew Stafford‘s touchdown pass early in the fourth quarter gave the Lions a commanding 31-14 lead. Rodgers answered with his third touchdown pass of the half to make it 31-20, but Crosby’s extra point hit the outside of the left upright and bounced harmlessly wide. Needing two scores to tie, the Packers elected for a 56-yard field goal attempt on fourth-and-15 with 3:20 to play. Crosby’s low kick slid to the right for his fifth miss of the day.